It was a bit sunnier on this brisk, windy day in February, and Jeem had talked G.G. Blynn into going surfing with him. No one else in the group was sure if either one had ever surfed before. "Maybe the Newton Wave Pool in Surrey," guessed BT Mendelbaum (disbarred). "Now we want to head out there." And so they were off. Getting into the water was the easy part. Swimming, paddling against the tide, the crashing surf, was quite another thing altogether. "I think Jeem is getting on his board," Sherry called out to the others. "Oh, oh" mumbled BT Mendelbaum. So it went. Never quite making it. Never quite riding the big one. But a great deal of paddling, and getting wet and numb from the cold. "How long do we have to watch this train wreck?" complained BT. Copyright 2017 by Jim Murray. Well, it took a bit of wrangling to get everybody back in the car after stopping at Cathedral Grove. BT Mendelbaum, disbarred, decided to check the various parked cars for signs of premature rust (something about a class action of some sort), and G.G. Blynn wandered off the path entirely looking for "fresh powder" apparently. Finally, we arrived at Tofino and MacKenzie Beach, a wee bit later than expected. Group road trips are never that easy. The tide was out. The air was cool but calm, and the clouds heavy. It would snow a bit this night. The next morning, the tide was coming in, crashing against the rocks with a frenzy. The air was cold and the wind brisk. "I could surf in this stuff," said Jeem to no one in particular. "Not near those rocks I hope," was Sherry's response. "No. Out there." And with that, Jeem was off to find a wet suit and a board. Tomorrow: surf's up. The City of Vancouver has just spent $8000 on a new logo. It will cost much more to implement the change, to letterhead, trucks, cars, banners, and god knows what else, etc. Mayor Gregor Robertson says the new logo is "bolder and brighter and cleaner" than the old one. Right. City staff suggest the new "wordmark" presents an image of Vancouver as "as a modern, innovative and highly desirable place to live and work." Okay. $8000. Or would it look better as $8000? Or maybe: $8000? What exactly are those people doing up in City Hall anyway? A new budget is coming to British Columbia on Tuesday and Christy Clark will smile, and hope that voters will smile too. But wait a minute... All is not as Christy would have us believe. Just a few months ago we heard that "110 million extra dollars" would go "to education this year." This year meaning 2016. The idea suggested in the the remarks of MLAs and the Minister of Education himself, was that 110 million new dollars would find their way into public education in 2016 (exclusive of capital spending) over funding in 2015. Sounded like a great deal at the time. In truth, Christy Clark's Liberals didn't mention that 48 million dollars of that extra money would actually go to private schools. Nor did they mention that 36 million dollars of that extra money would to to "other partners" which included public libraries. Now let's be clear: private schools are not really public education. And as nice and wonderful as public libraries might be, they aren't really public education either. What sounded like a great addition to the funding of public education in this province in 2016, turned out to be an additional 28 million dollars. That was less than a 1% increase over the previous year, and that, in truth, was actually a cut because inflation was 1.9% at the time. Through these revelations, Christy kept smiling. Then there's the 3 million dollars Christy Clark and her Liberals spent fighting the BCTF ~ all the way to the Supreme Court of Canada. 3 million dollars of our tax dollars spent... for nothing. 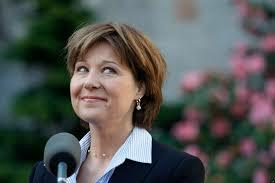 Maybe Christy and her Liberals should pay the 3 million back to the taxpayers of BC. So what happens to public education on budget day 2017? What will the numbers really mean for schools and our children? Will the numbers even add up? Christy will be smiling of course. There's an election coming and we have a chance to send a message. Get involved. Get informed. Vote on May 9th. And aren't we all just a wee bit tired of that dumb smile? Phở places have become ubiquitous in MetroVancouver and Jeem and G. G. Blynn were pleasantly surprised when friends from the John Harris Gallery took us to one such establishment in Nanaimo. Phở Tintin is located in a strip mall somewhere in this Vancouver Island city. On the day of our visit the snow was piled up and much more was on its way, but not before Jim and Sherry made their escape to a more westerly locale. The restaurant is delightfully pleasant and inviting, on the inside (on the outside, not so much). The clumsy clutter and kitschy-ness of most Vietnamese restaurants in Vancouver is not present at Phở Tintin. Not at all. On the day of our visit Phở Tintin was not busy, due to snowfall warnings, but it's normally busy through the day and especially for lunch. There's the usual menu with some local variations on the traditional theme, and a good number of vegetarian, or near-vegetarian dishes. The soup was hot and fragrant, though hot chili peppers were not initially provided with the sprouts. The spring rolls were smallish to what I'm accustomed, and possibly a wee bit over cooked, but flavourful and delicious just the same. All in all, Phở Tintin is a wonderful place, and unlike many phở restaurants, it takes credit and debit cards for payment. We'll return if ever we can find it without our friendly guides. But then again, that's what friends are for. We've been here before. The Crow and Gate. BC's first pub. And it's almost reason enough to come to Nanaimo. This time, there was snow, a lot of snow. But our friends from the wonderful John Harris Gallery in Nanaimo made sure we arrived safely. The Crow and Gate is interesting for several reasons: the lack of french fries from a delightful menu of honest pub fare is one, and the absence of any television or video screens is another. The music is muted, the service friendly and the variety of refreshment options exceptional. There are several wood burning fireplaces which felt heavenly after the journey from Vancouver. Unfortunately, Jeem was asked to leave after he attempted to stoke the fire, but that meant an extra pint for your faithful scribe. We should come again. And so should we all. Minus the snow next time. Last week, the whole gang was off to Vancouver Island. Sherry had a reading with Theatre One in Nanaimo, Jim was planning on surfing in Tofino, and BT Mendelbaum (disbarred) and G. G. Blynn were along for the ride. As usual. First stop is Horseshoe Bay where we await our ferry, and it's coffee time. Seeking out something better than Starbuckian is always top of mind. Here in Horseshoe Bay, the Seaside Village Cafe is a possibility. Small and friendly, it is pretty much the opposite of the corporate coffee shops. The barista knows her customers, mainly locals, and there's a simple pleasure to be found in listening in on the conversations. Freshly pressed juice is an option, as are the usual pastries and a few other breakie type items. The coffee was strong and comforting. As were the people around us. But the ferry ride beckons, and we were off. Perhaps in more ways than one. Something has been happening on Canada's left coast and it isn't fair. 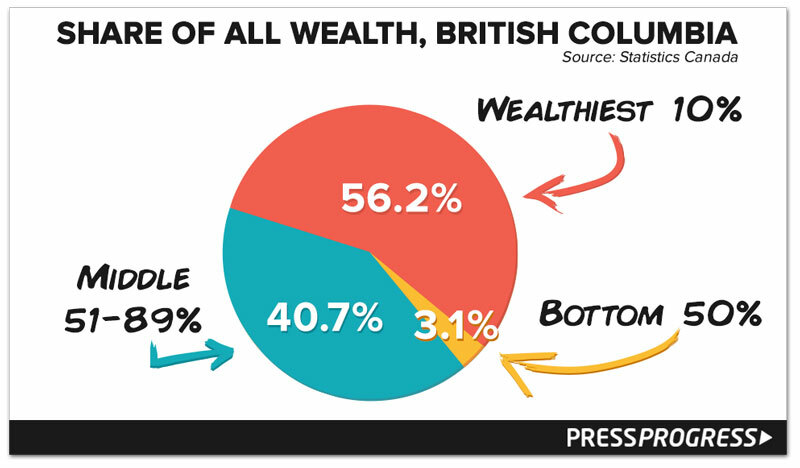 A small number of people in BC have become wealthier, the rising cost of living (especially of housing) and a trend towards lower wages have combined to increase the gap between the rich and poor significantly. 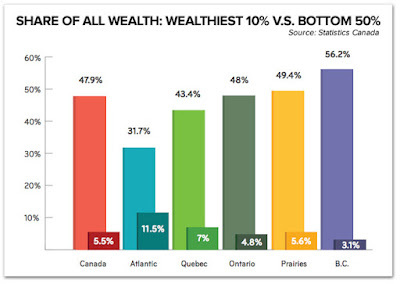 In fact, BC is now the most unequal province in Canada. The Canadian Centre for Policy Alternatives shows that the BC Liberals "decade of tax cuts" and continuing "regressive changes to the provincial tax system" helped to "exacerbate growing income inequality in BC." At the beginning of the century the wealthiest ten percent saw their earnings "spike" while the lowest fifty percent saw their earnings drop. 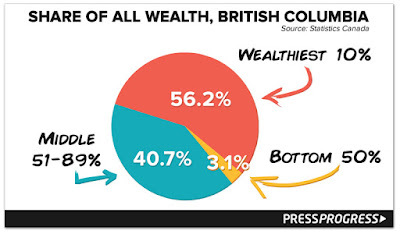 And this after the BC Liberals under Gordon Campbell introduced tax changes that benefited top earners. 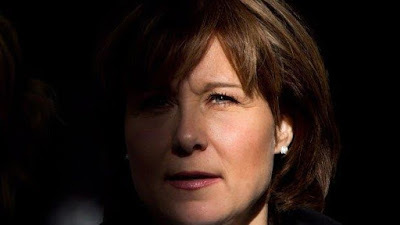 The trend has continued under Christy Clark, indeed the BC Poverty Reduction Coalition says the income gap in BC is growing at a faster rate than most of the other provinces in Canada, noting that the "average household income of the top one percent in BC has increased by thirty-six percent since the mid-2000s." The most recent available data from Statistics Canada shows that the richest ten percent in this province own more that fifty percent of all the wealth in British Columbia. 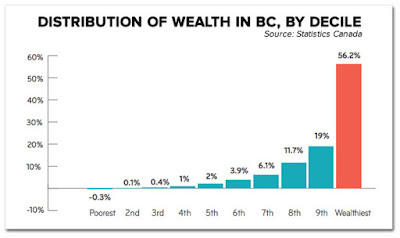 Christy Clark, our smiling photo-opportunist premier, doesn't mention the growing polarization within the province, but her regressive tax policies continue to exacerbate the problem. Graphs by Press Progress. Copyright 2017 by Jim Murray.